Below you will find many informative links about the Australian Shepherd breed, health and genetics, holistic approach to health care, nutrition, raw diets, vaccination to maximize protection and minimize risks, age appropriate spay/neuter, natural flea/pest repellent, general care, grooming, high quality equipment/supplies, trainers and more. Check back regularly for new links. "Is an Australian Shepherd the Right Dog for You?" "Is the Australian Shepherd Right for you?" 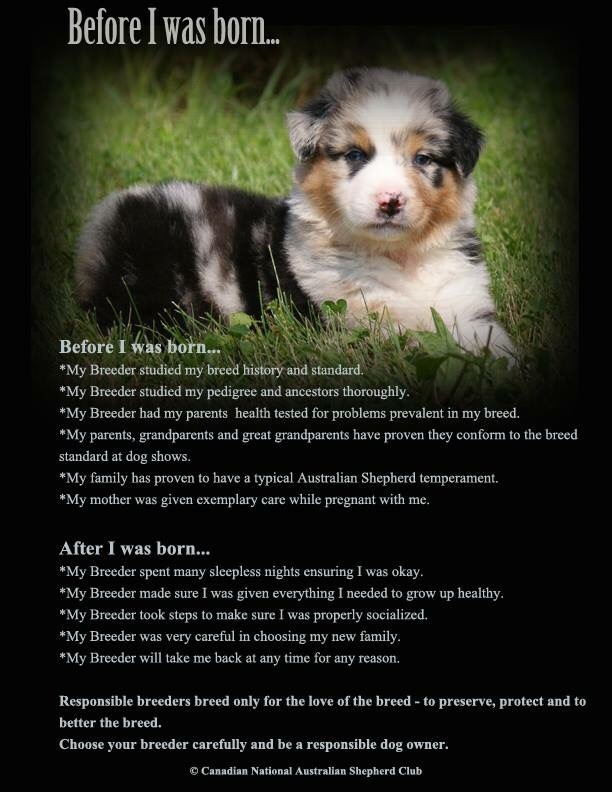 "I don't want a show dog: I just want a pet"
"Raising an Australian Shepherd: Temperament and Development"
Post by United States Australian Shepherd Association. Improve your animals physical and emotional health. "Health Implications in Early Spay and Neuter in Dogs"
"Diatomaceous Earth (food grade): bug killer you can eat!" Food grade Diatomaceous Earth - an all natural, non-toxic and effective pest control! "Natural Flea & Tick Remedy for Pets - Food Grade Diatomaceous Earth"
Tips to ensure your dog is at their ideal weight. Many benefits for animals and people. #1-selling colloidal silver brand. Often available at local health food stores. A sweetener that is lethal to your dog. Where natural food is raw food! Our favourite method of nail care. "Puppy Socialization - what it really should be"
"Following: The most important, and hardest, puppy obedience lesson to teach"
"What is a Title, Really?" Book: "Building Blocks For Performance 2nd edition: Give Your Puppy A Headstart"